One of the troubles with the grown-up world is that it’s jam packed with, well, grown-ups. People who have long since fallen into an ever-deepening self-seriousity. They forget what a rollicking good time looks like. It’s been years since they have let themselves play. Even longer since they have let themselves giggle. Kim & Jason Kotecki call that sad state Adultitis, and they’re on a mission to help all of us rediscover the childlike joy that life has to offer. 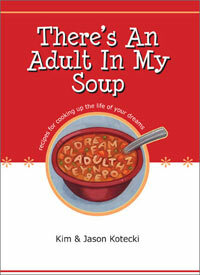 Their latest Adultitis antidote is their new book, There’s An Adult In My Soup. The book, a collection of short essays on bringing a childlike sense of play and wonder into our often too-serious grown-up lives, is perfect as a quick mind-snack. Pick it up, flip it open, and read whatever catches your interest. Each essay is short enough to read as you take a 5-minute break from your workaday world. Far from being frivolous and silly, overcoming Adultitis can open the door to a potential that we squash when we suppress the flow of childlike fun. It loosens us up, helps us be more creative, and makes it easier to roll with whatever life brings. Well that, and life is just a whole lot more fun when you can shamelessly stomp in puddles without worrying who might be watching. The fact that this review appeared on his blog at all is pretty humbling. While he agreed to take a look at the book, he noted that he doesn’t like to post negative reviews on his blog. That being said, he warned that if he wasn’t a big fan of the book, he probably just wouldn’t post anything at all. I didn’t see anything from him for a while, so I feared we had whiffed big time. Fortunately, that was not the case. Clearly, he is a intellectual powerhouse with impeccable taste. You should go read his blog right now, and bring more passion into your life.